Welcome to part three in The A.V. Club’s four-week guide to kids’ shows that parents can actually stand. We’ve already navigated the retina-scarring brights of pre-K viewing, as well as the Fraggles and Phineases and Ferbs of the kindergarten-through-1st grade set. This week, we enter territory that regular A.V. Club readers may already be familiar with. A quick scan of TV Club will tell you that we’re already big fans of Adventure Time, The Legend Of Korra, and last year’s amazing Over The Garden Wall mini-series. So here’s a brief primer on these favorites and a few others, basically because we can never write enough about Gravity Falls. Outside this list, we encourage you to check out other options in the TV Club canon, particularly the superhero series of Justice League, Young Justice, Batman: The Brave And The Bold, Ultimate Spider-Man (a bit more obnoxious than the others, but we felt we needed a Marvel mention), and that plucky upstart Steven Universe. Next week, we wrap this all up with a list of kids’ shows to avoid at all costs. If you’re concerned about whether Caillou will be on that list, rest assured that Caillou was the reason this entire Inventory series was invented in the first place. The Magic School Bus books received an excellent cartoon adaptation, highlighted by the zany vocal stylings of Lily Tomlin as Ms. Frizzle. The literary series was made to be animated, so that kids could travel through the layers of Earth, to the bottom of the sea, to the end of the solar system, and inside Arnold’s digestive tract. Look for Ms. Frizzle’s outfits to feature themes from that week’s episode, the iguana to save the day, and special guest stars in the followup questions at the end. In our mission to push science to the kids, The Magic School Bus packs the most information. This source material is so rich, a Magic School Bus 360˚ reboot is already in the works, courtesy of Netflix. Suggested reading: The amazing Magic School Bus books are available in a variety of formats, from easy reader to chapter books. The level in between those two offers the perfect combination of picture books balanced with loads of sidebar and auxiliary information. Those science reports will write themselves. SpongeBob SquarePants is the ultimate in shows appreciated by both kids and adults: Kids love the crazy antics and adults appreciate a whole separate level of humor. Nickelodeon’s longest-running series, SpongeBob has always featured the appealingly goofy main character (The Krusty Krab’s greatest employee), along with his loyal friends, kicked off by the catchiest theme song around. The absurdist Tiki background lends itself to insane storylines (like Spongebob making Squidward a sweater out of eyelashes, or visiting the fantastical theme park Glove World) that leave the viewer completely unaware as to what could happen next. This is possibly the only cartoon here that’s even louder than your own kids. The movies aren’t bad either. Kudos to the Peabody Awards for recognizing the amazing qualities of this series, which balances kid-familiar concepts like fart jokes and sibling rivalry against the most bizarre backdrop on our list. The humor in it is literally like no other, but still relatable enough to resonate across demon-filled landscapes, wizards, princesses, and a boy with a magic dog. It’s a land where even sandwiches are mystical, as the Peabodys cited, in a “uniquely imagined, truly odd fantasy world.” The kids will be doubled over, and you won’t believe what you’re watching. The Scooby-Doos we all grew up with were pretty good, even with the canned laughter and the now-rampant cliches (“And I would have gotten away with it too…”). But the recent reboot adds some extra serialized mystery in the town of Crystal Cove, a DJ that sounds like the narrator in The Warriors (voiced by Vivica A. Fox), and lots of needed meta commentary: There is no reason in the world that Fred should still be wearing an ascot. Even better are the pop-culture references that abound in the plots, from Twin Peaks to 90210. Where else are you going to find an animated sendup of Andy Warhol and his relationship with the Nico-era Velvet Underground? Nowhere, that’s where. You will get so much out of this series that your kids won’t even catch. If you take nothing else away from this four-week Inventory, take this: Watch Gravity Falls. The Disney XD show supersedes everything else on that network and most others. The story of twins Mabel and Dipper in a mysterious Oregon town personifies the terrors of a tween summer, while empowering its young heroes to defeat every otherworldly obstacle in their midst. A love god in a festival rock band who’s actually a cherub? An online gaming girlfriend who turns real? A generic boy band that consists of a collection of clones? 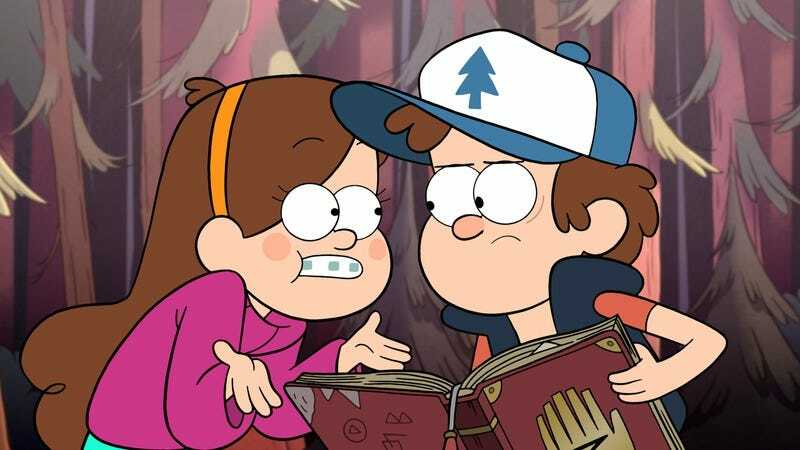 Each inspired Gravity Falls chapter is bolstered by stellar voiceover work by Jason Ritter, Kristen Schaal, and Linda Cardellini, with show creator Alex Hirsch as the show’s best character, Grunkle Stan. You may have to wrestle with Disney XD’s downright disrespectful broadcast schedule to find the rare new episodes, but trust us, it will be worth it. The Legend Of Korra is another opportunity for girls to take center stage, on Korra’s quest to become an avatar. Over this series’ four seasons, we see the young Korra grow and mature as she leaves her home to embark on air-bending training, against the gorgeous backdrop of the Republic City she has to protect. In between, like any adolescent, she grapples with various crushes, and the multitudes of her new responsibility. At the beginning of the series, Korra is a fierce warrior, but doesn’t yet have the maturity and mental strength to be a true avatar, giving kids a chance to ponder what true strength is. The martial-arts action segments are unparalleled (like an animated Crouching Tiger, Hidden Dragon), but Korra’s status as one of the great feminist cartoon heroines secures her place on this list. This strange, wonderful creation was the Cartoon Network’s first mini-series in 2014, offering ten 12-minute episodes. These addictive small segments offer the tale of two brothers (Elijah Wood and Colin Dean) who travel through a dark yet magical universe with talking bluebirds, an enigmatic woodsman, and a terrifying unseen beast. Patrick McHale’s (The Misadventures Of FlapJack and Adventure Time) miniseries offers influences of early European folklore, and the scary parts of Grimm tales as the brothers navigate their labyrinthine limbo. What’s a better metaphor for growing up than that? The desire to get through the entire series immediately to discover the brothers’ ultimate fate will likely result in your kids’ first binge-watch.